I just LOVE these~!! Ahem. I had to get that out. You see, forget-me-nots are one of my most favorite flowers. 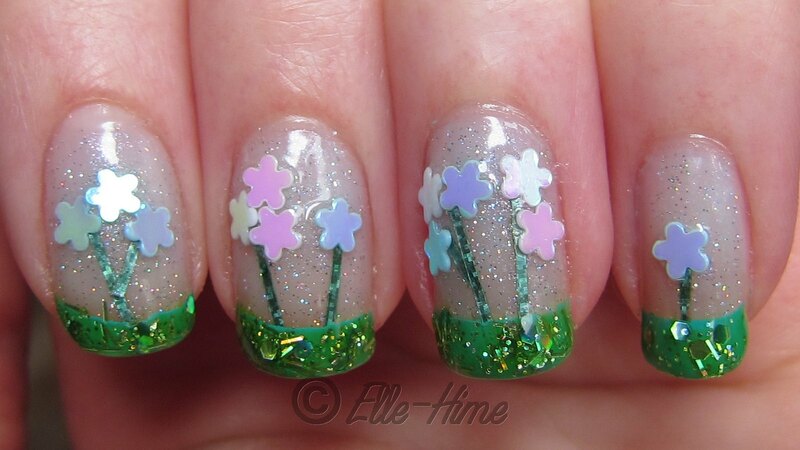 =) And they were easy to mimic since they are a basic 5 petal shape. The steps I used to make these are after the jump. Cut small bits of green striping tape and create stems on the nails, using smaller pieces to branch off from the main stem. Cover that green with a green glitter. I used Dare to Wear Disc Jockey because the bars made me think of grass, but it's grass-stain green base doesn't really match FLC... oh well! Take away the tip guides, carefully! They might try to pluck your flower stems. Cover everything with a thick clear coat and press clusters of white and blue flower-shape paillettes, or "spangles" into the wet polish. 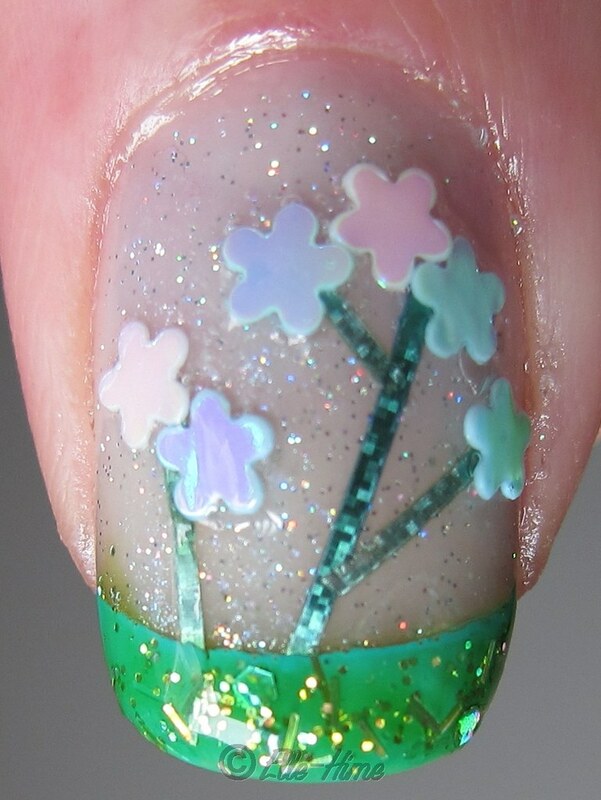 Finish the nails with lots of top coat to seal in the flowers! Here is a shot of the finished nails with flash. 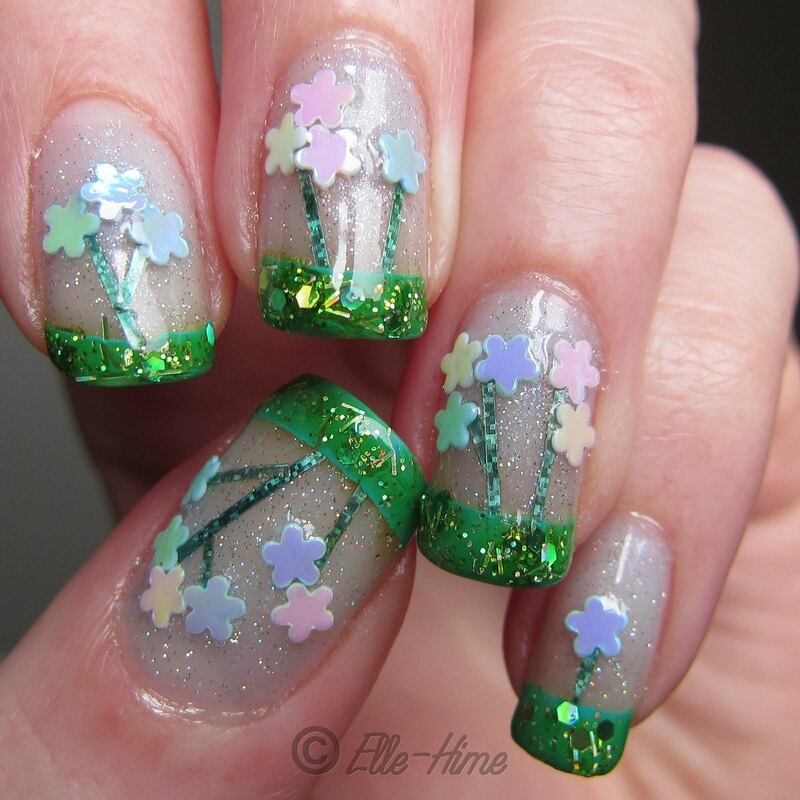 And yes, I used just two colors of flower paillettes. They all have a iridescent coating on them that shines pinky-purple, which works perfectly as forget-me-nots because they come in all those colors! I absolutely loved wearing these and I'd definitely do them again, perhaps in different color variations! 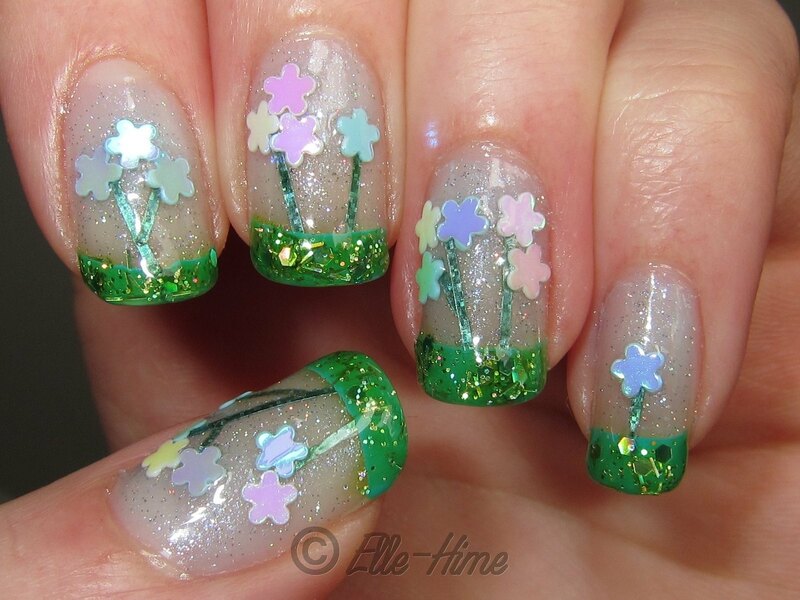 In these colors it makes for a soft and dainty look, but with bright flowers it would be a good summer manicure. Like I said before, these were originally for a nail art contest on another blog. I just focused on doing my nails and then took pictures of them. Would anyone want to see a step-by-step tutorial, or is the text description above clear enough? Thanks muchly for the comment - I'm glad you do! Are you a goddess or what???? FANTASTIC!!!! !